STEP RIGHT UP! GET YER CLOWNS HERE! 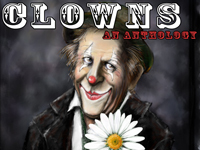 Clowns: The Unlikely Coulrophobia Remix is hot off the presses! So get your hot, pressed clowns today! Or if you prefer your clowns cold-pressed, never fear. A clown is nothing if not adaptable. 22 tales to horrify and delight, by authors Derek Manuel, T. Jane Berry, J.H. Pell, Jeff Wolf, Kristen Roupenian, Carolyn M. Yoachim, Mari Ness, Evan Dicken, Carlie St. George, Line Henriksen, Virginia M. Mohlere, Dayle A. Dermatis, Jason Arias, Joe Nazarre, Karlo Yeager-Rodruigez, Sara K. McNeilly, Chris Kuriata, Cassandra Khaw, Cate Gardner, Charles Payseur, Chillbear Latrigue, and Holly Schofield, with an introduction by Robin Blyn and illustrations by Bryan Prindiville. Pin the spider to download as PDF. Don't miss out! Sign up here to be notified of new issues, interviews, and more.